Whoa…a bit of a rough run it’s been in 2017. 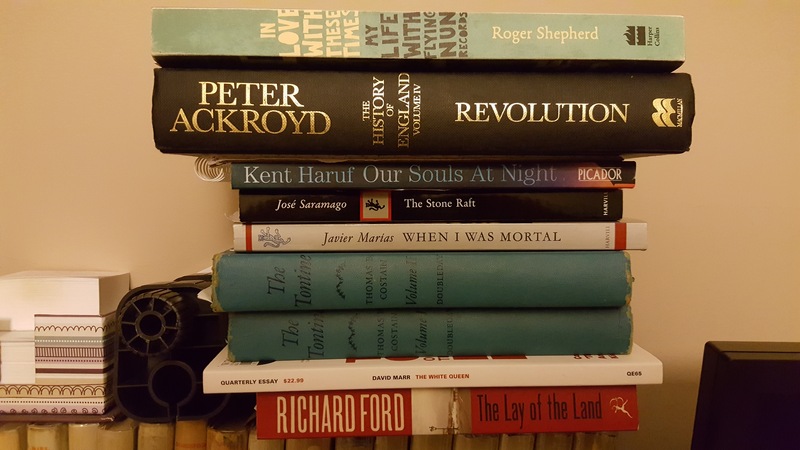 A few unfinished novels including the lauded Richard Ford (Lay of the Land – 2 stars). I guess this signals I’m really not truly ever going back to an American novel phase in a hurry. Having said that, I managed to read Haruf’s Our Souls at Night which was sweet but didn’t quite have the impact I’d hoped (4 stars). The fourth of the English history series Revolution by Ackroyd (3 stars) was a bit of a dry slog, and did inform me of the first three Georgians, but I feel like I need to read another book to commit Hannover things to memory a little better. Somewhere in the pile was a decent Quarterly Essay by David Marr on Pauline Hanson. My god, I am leaving things so long before write ups that I can barely remember them. The Tontine books (by Costain) I got for a buck each from an Op Shop and were an enjoyable romp, though they took awhile to get through. 3 stars. The Stone Raft by Sarramago was a magical road trip by a small group of oddballs and a stray dog around a cast-adrift and erratic Iberian peninsula for a purpose I can no longer remember. Quite a charming novel though – 4 stars. When I was Mortal by Marias was a fantastic bunch of often menacing and unpredictable short stories, translated from Spanish. Loved nearly all of them and just tore through this book. 4.5 stars. A gift from my old mate James, In Love With These Times by Flying Nun Records founder Roger Shepherd was an easy, if mediocre read. He seems to have done his fair share of drugs and booze and the recollections are accordingly hazy. 3 stars for him being an unapologetic Clean and Chris Knox fan, and for admitting he was often pretty bumbling and incompetent. mjd on On rainy days like these, I am still reminded of when..